Okieladybug's Scrap N' More: Pocket card........Halloween!! BUT!! 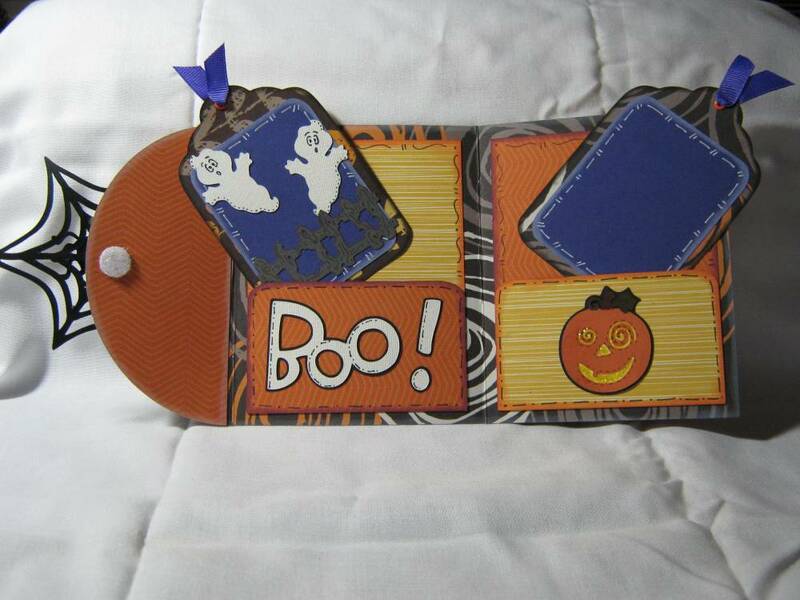 If you want to make this particular card you can download the POCKET HALLOWEEN CARD. All of the work is done for you! *okie grins big* The carts used are George, SYI, PDDU and Paper Pups. If you don't have all of those then you can just delete what you don't need and add what you do. So anyway here are the photos. I used Paper Doll Dress Up for the web and the spider. I did add a pop dot under the spider. OH yeah.....this is an A2 card so fits in a standard size envie. But with all the stuff it will require extra postage because it is over 1/4" thick. 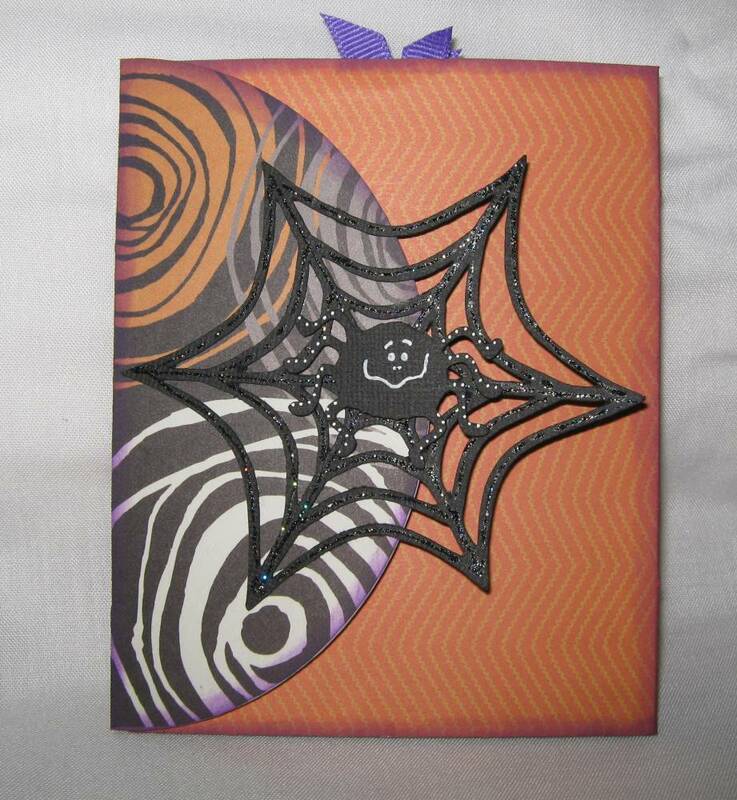 I used a velcro dot to keep the card closed and added some Scotch 2 way glue to make the card stay closed. Here is what it looks like with the ta gs pulled out. Now you can see the fence. I left one tag blank so writing could go there. The mats and ribbon are purple, but kinda look blue to me in the photo.....WHAT IS UP WITH THAT?? You can see the velcro in this picture. Oh if you click on the picture it will show the larger version and you can see the detail better, especially the fence. Anywho....hope ya'll enjoy the card! THANK YOU Okie!! This is so cute. Can't wait to make one. Love that the cut file is baby bug size!! Glad ya'll like it! I like this little card for it's versatility!! Thank you so much for sharing your great pocket card and for the inspiration. Can't wait to sit down and make a couple of cards now that I have the PDDU cart. i love this card and had fun making one of my own. You can always send me one of your halloween cards and i can send you one of mine. I love it!!! You make it look so easy! I need to start making some Fall stuff, too! 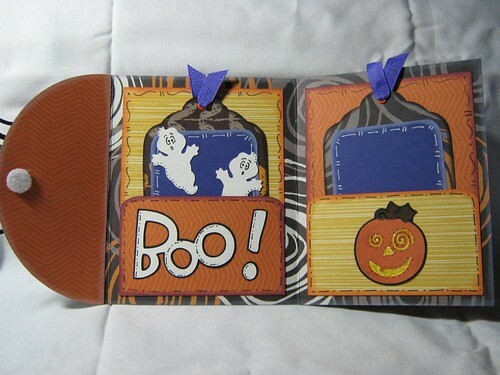 TFS, this is an adorable card! This is an awesome card!.. Love the colors you used and the doodling.. Thank you for the awesome card! I love it! And thank you for sharing your wonderful creations with us! Thanks Okie! I've been buying a lot of gift cards lately (we have lots of October birthdays in our family). It's too late for those cards, but Christmas is just around the corner -- TFS! These cards are sooo cute. Thanks for sharing, I can't wait to make them. This is one adorable card, and so versatile. I think if you are willing to share the cutfile I would like to see if the tags are big enough to attach a gift card on.